Maharishi Markandeshwar University (MMU), Sadopur-Ambala (Haryana) has given a notification of Teaching and Non-Teaching Vacancies. The interested candidates can apply for the MMU Recruitment 2018 on or before 14 June 2018. MMU Ambala Recruitment 2018-19 notification is out. 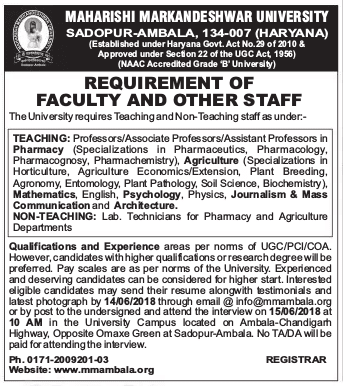 As per the Notification, there are various Teaching and Non-Teaching Vacancies. The educational qualification is as per the UGC/PCI/COA norms. The age limit is for MMU Haryana Vacancy is as per the department norms. If you are looking for Teaching and Non-Teaching Jobs in Maharishi Markandeshwar University, Haryana then this article is going to be very helpful for you. The qualification is as per the UGC/PCI/COA norms. The candidates with higher qualifications or research degree will be given preference. As per the MMU Ambala University norms. You may send your resumes along with the testimonials and latest photograph by 14.06.2018 through email at info@mmambala.org. You can also send your application by post to the Registrar Maharishi Markandeshwar University, Sadopur-Ambala (134007), Haryana.